After tying the knot, one most exciting, exhilarating and romantic section of your wedding is the honeymoon trip which turns out to be really valuable for newlyweds as well as for those who seek a romantic, peaceful and relaxed vacations with their beloved. It is indeed the best time for you to spend some quality time in knowing each other in a better way. So where are you guys planning your honeymoon? Have you made your choice, not yet? Well, that was obvious because making a particular choice over a number of honeymoon destinations all over the world is not an easy issue. Since honeymoon trips come out to be the most treasured/cherished voyage of a lifetime to remember, you can`t just go picking any place for spending the first few precious days of your new life. To help you escape from the real dilemma, we have come up with a place which by any chance is not at all a bad option. If both you and your spouse are fond of nature then far away from the hustle bustle of the city get ready to be awe-struck by the imposing serenity of Himalayan mountains and hills, luxuriant green forests, verdant valleys and rich flora & fauna because guys, there is a tiny kingdom in Asia where happiness of the people is given the first priority. The awesome place is none other than the last existing Shangri La of the world, ‘Bhutan’. 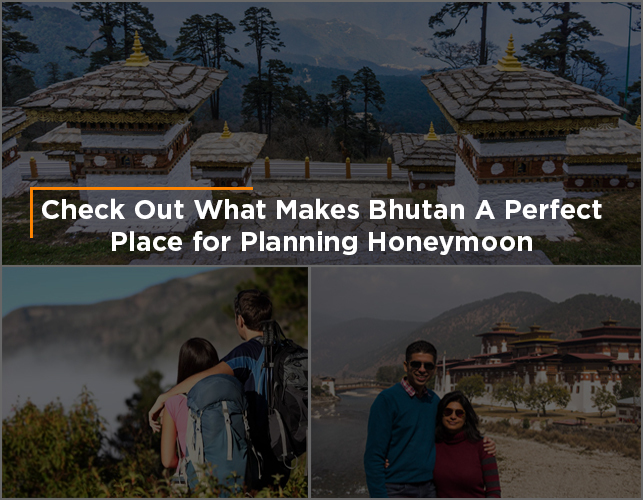 Why should you go Bhutan for Honeymoon? Although Bhutan for honeymoon might sound quite uncommon but believe us, there is no other place like the Dragon Kingdom which offers astounding Himalayan grace making initial days of your marriage exciting, romantic and a much lovelier affair to remember. Truly nature has been extremely generous to Bhutan as it offers some of the most fabulous landscapes and picturesque locations with a peaceful environment and pollution-free air where you can sit hand-in-hand with your beloved watching the melody of colours and unparalleled beauty of the snow-covered peaks, little streams, herds of yak and the colourful rhododendrons blooming the valley. Not only this, even the adventurous side of Bhutan has a lot to do with the honeymoon. Just imagine what could be more romantic than walking miles with hand-in-hand exploring the spectacular sites of the province and at the same time paying devout to the age-old pilgrimage sites. Well, guess all our readers are familiar with the royal romantic couple of Cambridge ‘Duke William and Duchess Kate’? So the reason why we have mentioned them in middle of the honeymoon trip to Bhutan is that this symbolic royal couple too had made a visit to this blissful Land of Happiness in 2016. 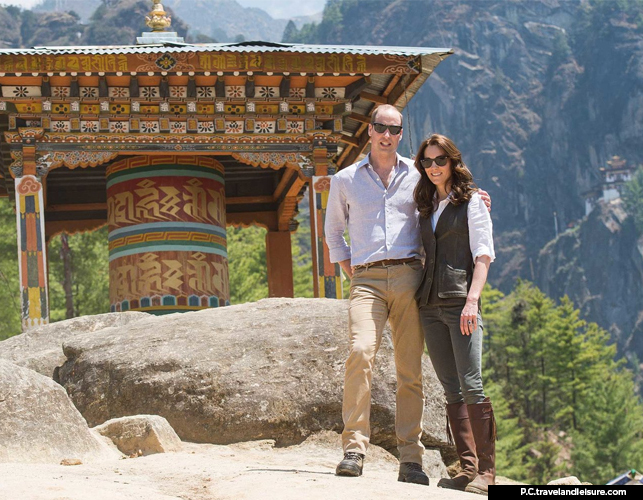 Prince William and Kate were in fact, spotted hiking up hand-in-hand to the Tiger`s Nest Monastery (also known as Taktsang Monastery) at Paro Valley. Doesn`t that sound romantic? Similarly, even you can make the same expedition up to this centuries-old sacred gompa which in return will surely leave you with memories of a lifetime. So treat yourself to Bhutan honeymoon tour packages for a personalized meticulous and exotic outing. It is indeed worthwhile and spectacular, simply a place like heaven on earth where you can discover your soul mate more passionately and intimately. “This was our first experience staying with Aman, and it did not disappoint. While it comes with a premium price tag, we left feeling that it delivered more than the value we had anticipated. We enjoy our stays at Shangri-La, Mandarin Oriental, Ritz. These chains have some great properties, so we questioned whether Aman would deliver. With several staff for each guest, the service at Amankora is noticeably superior. Our guide was Sangay and our driver was Tashi. We would recommend and request both again. We stayed in Thimphu and Paro, as we arrived on Monday and were leaving on Friday morning. We loved Thimphu – the design and layout of the lodge, the local hikes and the city tours. We both agreed that it was the perfect way to start our trip. Each lodge features a different menu. Right now Thimphu is serving Thai and Paro is featuring Indian and Bhutanese. Of course, both also offer well executed Western dishes. As an example of their level of service, we left a shirt in Thimphu on the day we transferred to Paro. Without asking they sent a car to bring it to us within a few hours.